There is no substitute to having good solid information about where to find birds locally in any given area. Thus, this section of the Caloosa Bird Club website is geared to that purpose. Please make use of the comment section at the bottom of this post to let us know if you have seen any unusual birds at these “hot spots”, if there is information that needs updating or you have an additional area you would like posted. One of the first national wildlife refuges established in the USA is located on Sanibel Island and offers the birder an easy opportunity to view pelicans, wading birds including Roseate Spoonbills and shorebirds. Many of these birds can be seen from one’s car as they travel along the five-mile Wildlife Drive. (Wildlife Drive is closed off on Fridays to give the birds a rest and to perform maintenance work). There are birding platforms and overlooks (Red Mangrove Overlook) as well, where one may get lucky and see Mangrove Cuckoo (late spring through mid-summer at the area near the Red Mangrove Overlook). It is also one of the best places to view American White Pelicans in winter [Map] . 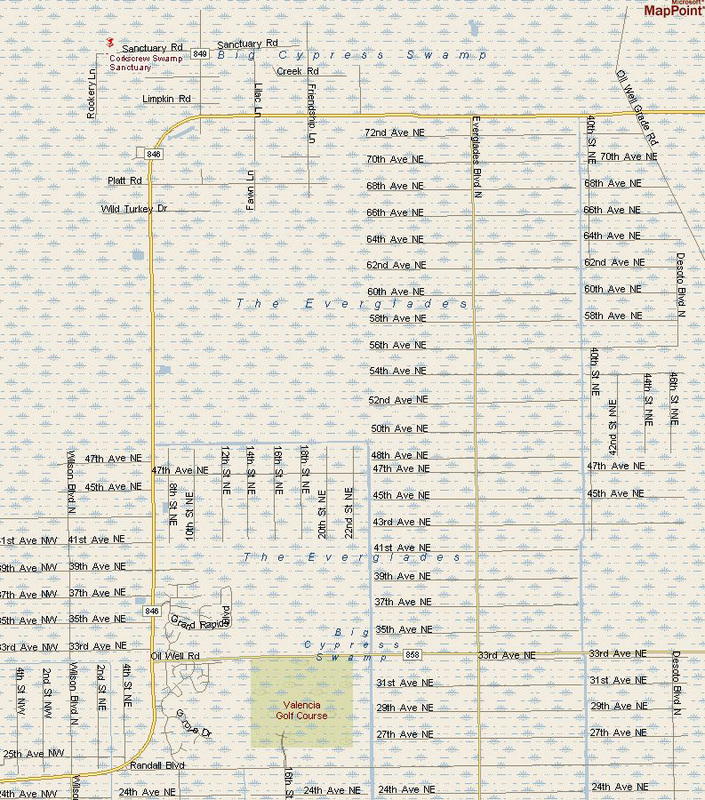 The Bailey Tract [Map] , another section of the Ding Darling N.W.R, is another good area for birding. 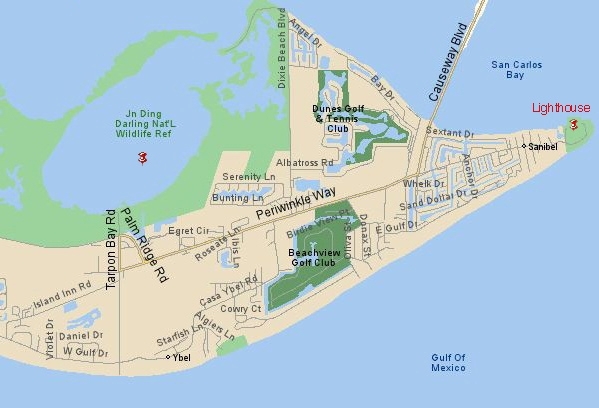 Directions: Upon crossing the Sanibel Causeway, turn right on Periwinkle Way to Tarpon Bay Rd. and take it 4 miles south. Here, nature trails cross wooded lots, marshes and ponds. Common birds here are waders and ducks (in winter) as well as Gray Kingbird and to a lesser extent, Black-whiskered Vireo in late spring and early summer. Warblers and other passerines can be good in migration. Rarities and uncommon birds here have included both Black and Yellow Rail, Whippoorwill, American Avocet and Black-necked Stilt. Bridge toll to the island is $6.00 and there is a fee to drive or bike Wildlife Drive. Be sure and visit the free visitors center while you are there. Viewing the shore birds is best done on low tide. Check out Sanibel Tides to find the best time to visit the refuge. Guided Walk Schedule: May-October: Wed only @ 9:30 a.m. April, November and December: Daily @ 9:30 a.m. January-March: Daily @ 9:30 a.m. AND 1:30 p.m. Guided Walks are limited to the first 20 people who show up (no groups of 6 or more). Private group tours are available for $3 per person. Contact Andee Naccarato by phone at 239-533-7555 or through email at ANaccarato@LeeGov.com. Directions: Located at Pt. Ybel at the east end of Sanibel Island off of Periwinkle Way. [Map] Parking is $2.00 an hour. The Sanibel Lighthouse is our only area magnet for migrating hawks and passerines in the spring and fall. Warblers, buntings, orioles, thrushes and other passerines can be phenomenal here after a cold front from the north in spring. Equally, in fall, overflying hawks can be exciting. Rarities and uncommon species have included MacGillivray’s, Connecticut, Swainson’s & Townsend’s Warblers, Western Tanager, Western & Gray Kingbirds, Mississippi Kite and Broad-winged Hawk during fall migration etc. etc. 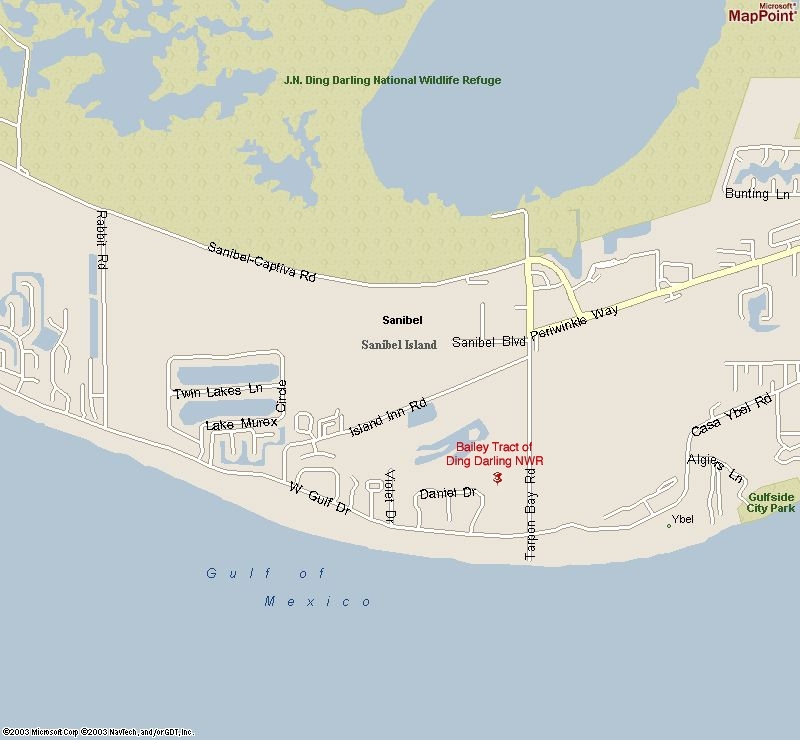 Nearby, in the waters of the Gulf, Heerman’s Gull, Western x Clark’s Grebe hybrid and Surfbird have been seen in recent years. 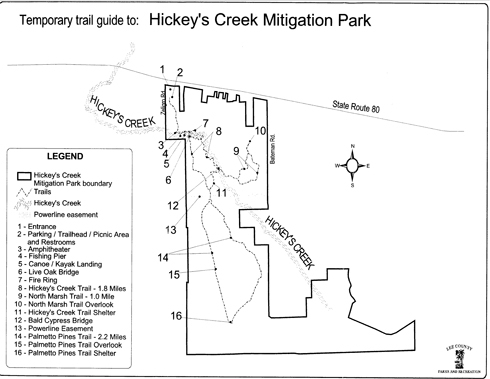 Opened in the spring of 2002, the Hickey’s Creek Mitigation Park is located at 17980 S.R. 80 (aka Palm Beach Blvd.) Take Exit 141(Old Exit 25) off of I-75 and go 8.8 miles east towards Alva. [Map] It has great potential for birders. It is reportedly to be the last stronghold for Florida Scrub-Jays in Lee County, which can sometimes be seen off of Bateman Rd. on the eastern boundary of the park. Several trails [Trail Guide] offer a nice hiking experience through pine flatlands as well as beautiful vistas of Hickey’s Creek. Canoe and kayak rentals are available. Parking fee: $1.00 per hour or $5.00 all day. 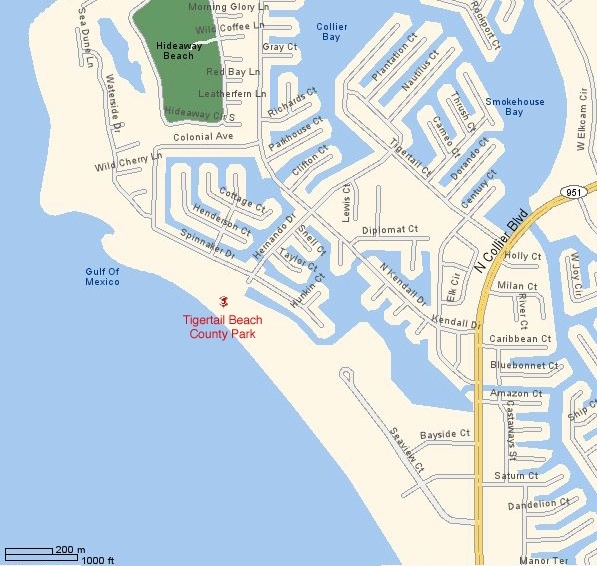 The nearby Caloosahatchee Regional Park [Map] is another good area to bird. 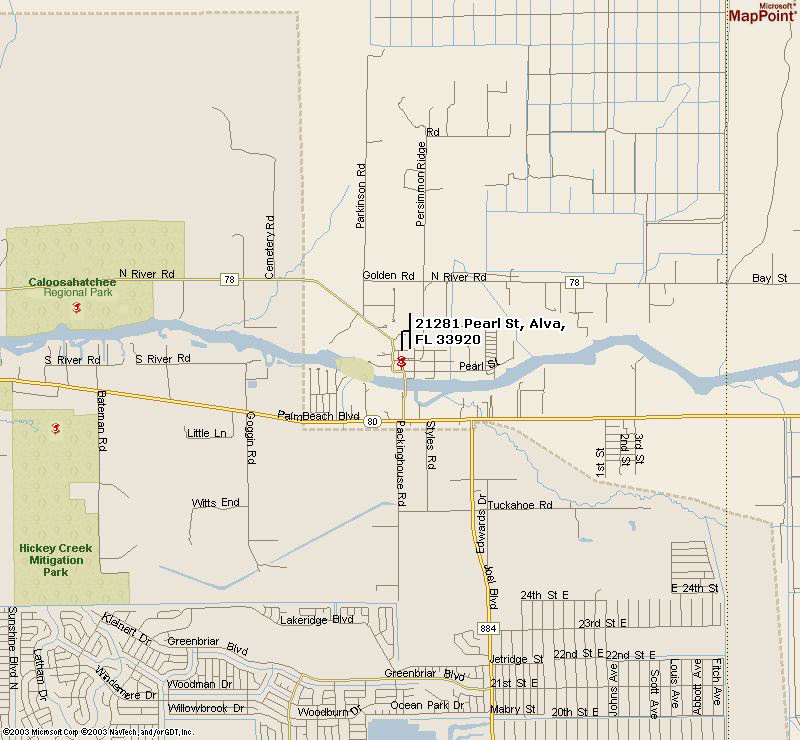 It is located on the north side of the Caloosahatchee River, two miles west of Alva on S.R. 78 (aka North River Rd. — Old Exit 26 of I-75). Red-headed & Pileated Woodpeckers are fairly common here and Swallow-tailed Kites are frequently seen in spring as they nest nearby. The W.P. Franklin Locks & Dam [Map] (on both the north and south sides of the Caloosahatchee River off of S.R. (78 aka North River Rd.) or S.R. 80 (aka Palm Beach Blvd.) was formerly quite good for Limpkin and other waders. Recent developments have all but stripped the river banks clean of vegetation for these birds. Bald Eagles are sometimes evident here however. — [Map] [Map] Directions: Exit 158 (Old Exit 27 aka Tucker’s Grade) from I-75. Take Tucker’s Grade to pay station booth. Florida seniors with in-state driver’s license get in free. Others must pay $3.00 per person or $6.00 per car. Check ponds around pay station area for waders, bitterns, grebes and sometimes ducks. Bald Eagles are fairly common here. On more than one occasion, several have been seen flying-down and capturing a Cattle Egret in mid-air and then taking it to a favorite perch to feast on it! But the outstanding reason for going to Babcock-Webb is to see the endangered Red-cockaded Woodpeckers, Bachman’s Sparrows (listen for their “Here Kitty Kitty Call” in spring) and Brown Nuthatches (listen for their “rubber ducky” squeaks.) These can usually be seen in early in the morning or late in the day in the Slash Pine Flatwoods along Oil Well Grade. (Watch for the “RCW” sign and “ribboned” trees marking the Red-cockaded’s nest trees.) Other common birds can be Northern Bobwhite (hunted here), Eastern Meadowlark, Sandhill Crane, Eastern Bluebird and Pine Warbler. Birders usually do a “loop” at Babcock-Webb e.g. entering on Tucker’s Grade and then turning left onto Oil Well Grade and then right onto Tram Grade (where there are more RCW colonies) and another right onto Seaboard Grade and finally another right back onto Tucker’s Grade to the exit. Or, one may opt to continue on Tucker’s Grade past Oil Well Grade all the way to Seaboard Grade, then making a left onto Seaboard Grade, all the way to Tram Grade (make left) to Oil Well Grade (another left) and then a right onto Tucker’s Grade to the exit. Note: Good news! Oil Well Grade is now re-opened so the RCW colonies along this road are once again accessible. There are other RCW sites about .5 miles down Tram Grade on either side of the road as well. 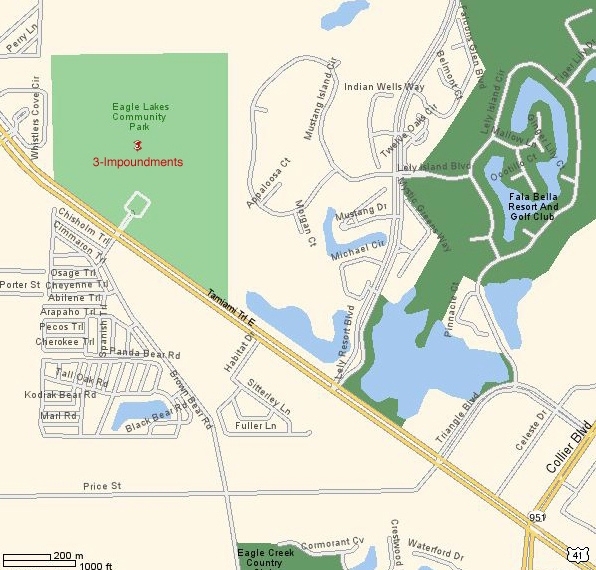 Harns Marsh, a 578-acre preserve in Lehigh Acres, is one of the area’s major storm water retention/detention facilities. Designed in 1981 by East County Water Control District (ECWCD), the intent is to eliminate or reduce flooding downstream along the Orange River during a major storm. 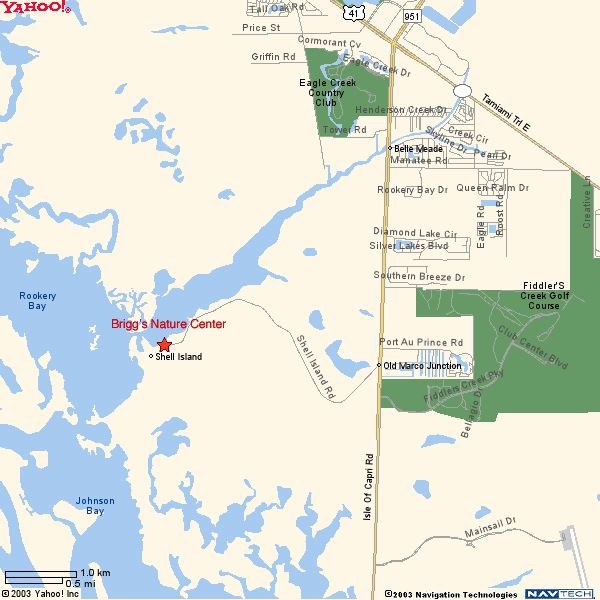 Harns Marsh has been used both as a campground for local Boy Scouts and the public for exploration and wildlife observation; however, cars must be left outside of the facility’s gate. For birders, there are a variety of water birds, such as Snail Kites and Limpkins, that feed on numerous Apple Snails. Most of the Egrets and Herons, as well as ducks, Coots, and Moorhens are abundant. As of 12/09 122 species of birds have been sighted at the marsh. There are no bathroom facilities and at the current time and construction is going on so use caution. Also be careful when walking; many red ant hills. The trip around the pond is approximately 4 miles. There is no automobile access to the trail around the pond unless accompanied by an official guide. 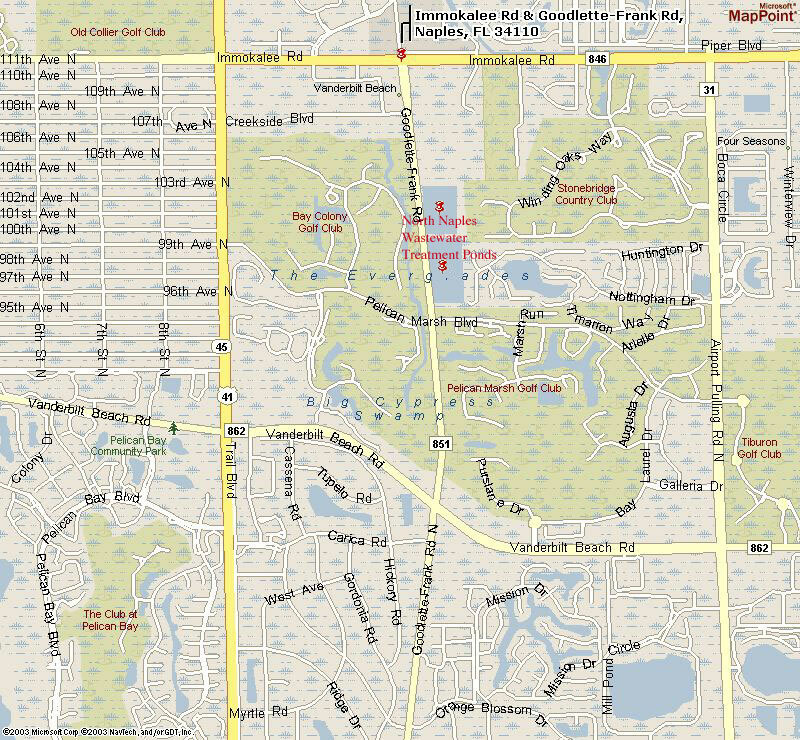 11565 Tamiami Trail East, Naples, FL. Phone: (239) 793-7465. 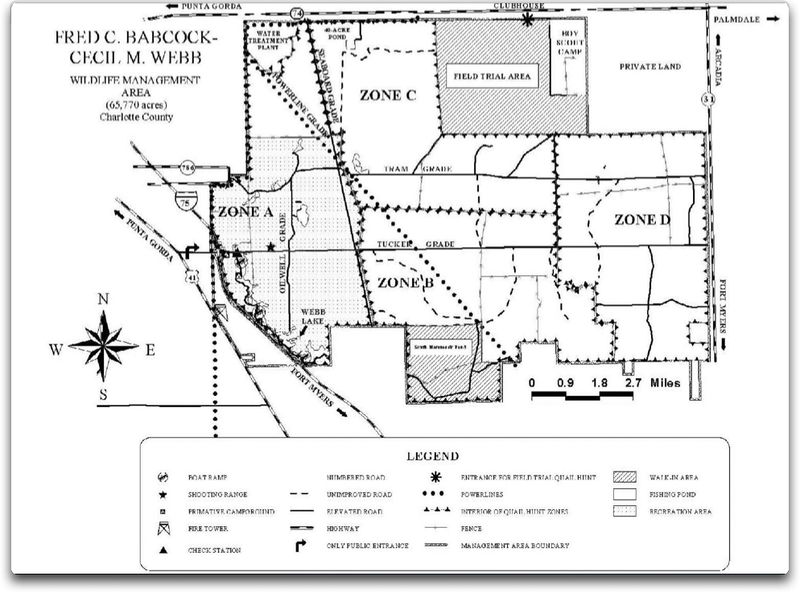 Part of the Naples/Collier County “Rural Fringe”. [Map] Directions: Go 3.3 miles east/southeast on U.S. Rte. 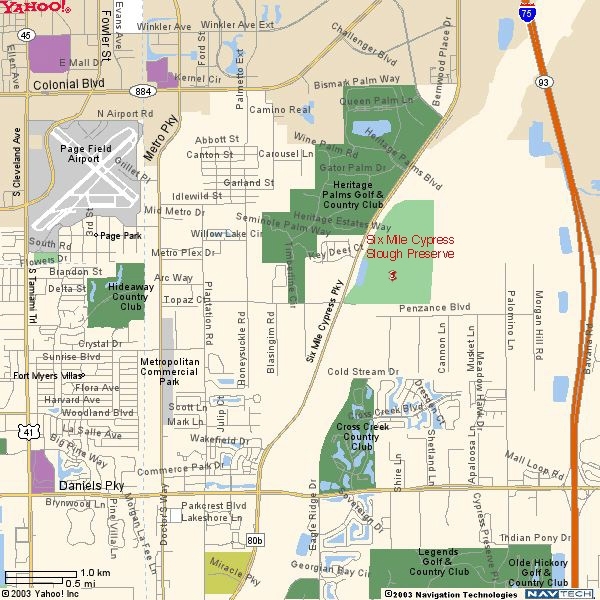 41 (Tamiami Trail) from its intersection with S.R. 951 (Collier Blvd.). Turn left onto Greenway Rd. and go approximately .75 miles to Fritchey Rd. Turn right. Bird (from the road) the flooded fields/wetlands on the right. Fritchey Road Wetlands can be excellent for raptors (Bald Eagle, Peregrine Falcon, American Kestrel, Osprey and even Snail Kite in late fall, winter and early spring depending on the water levels. American White Pelican, most waders, Sandhill Cranes (have nested here), Eastern Meadowlark, Eastern Bluebird, Eastern Kingbird, etc. In the winter of 2001-2002, a Scissor-tailed Flycatcher wintered here. Don’t forget to check the birds on Greenway Rd. as you turn off of U.S. Rte. 41. Eastern Bluebirds, Pine & Palm Warblers, Chipping Sparrows (in winter), Common Ground-Dove, Loggerhead Shrike and sometimes Northern Bobwhite can be found along this road. A Western Kingbird wintered here in 2001-2002 and up to five Western Kingbirds and a juvenile Scissor-tailed Flycatcher were seen near the intersection of Cecil & Greenway Roads in the winter of 2002-2003. One of the best kept secrets in Naples birding. [Map] Early morning is best. To reach the park, from the junction of Davis Blvd. & U.S. Rte. 41, take U.S. Rte. 41 (Tamiami Trail) south/southeast to Avalon Dr. The park will be on your right. Once in the park, turn right at the first stop sign. Follow Avalon Drive all the way to the dead-end parking lot on the northwest side of Lake Avalon near the grandstands where the Avalon Skimmers waterskiing team performs. A paved path leads off to the west of the parking lot. This path circles Lake Avalon. The best birding is along the west side of the lake near the Dominion Drive entrance on this path. In January 2002, a Franklin’s Gull was seen on the beach (turn left upon entering the park). Likewise, a Short-tailed Hawk was seen during the same month. Spring and Fall passerine migration can be good. Warblers seen in 2002 have been Kentucky, Blackburnian, Black-and-white, Prairie, Yellow-throated, Pine, Black-throated Blue, Black throated Green etc. Other good birds: Painted and Indigo Bunting, Merlin, Cooper’s Hawk, Wood Stork and many others. Located between Vanderbilt Beach Rd. (to the south) and Immokalee Rd. (to the north) on Goodlette-Frank Rd. [Map] Park well off of the bridge/overpass and walk up to the highest point on the bridge. A scope is necessary to see the various ducks (Northern Shoveler, Hooded Merganser, Mottled, American Wigeon, Blue-winged Teal, Green-winged Teal etc.) as well as shorebirds (if any of the impoundments have been “drawn down”) and wading birds in the wastewater treatment ponds to the east of Goodlette-Frank Rd. Magnificent Frigatebirds have been seen “dipping” in the water “on the fly” here in January, 2002. Black-necked Stilt, Solitary, Spotted & Least Sandpiper, Short-billed Dowitcher, Dunlin etc. have all been recorded here. Fall/Winter birding is best. Sadly, with the events of 9/11/2001, many people (including the Collier County Sheriff’s Department) have become hyper-sensitive to what they perceive as “terrorists threats.” Consequently, don’t be surprised if any passersby call the sheriff on their cell phone about “suspicious” behavior taking place at the North Naples Wastewater Treatment Plant. Rest assured, that as long as you are on the sidewalk and not on the plant property, you are legally allowed to be here watching birds. It might be prudent to let the sheriff’s department or the wastewater treatment plant supervisor know what you are about, before you go birding here however. . . . Just to avoid hassles. [Tigertail Beach Map] Directions: From the junction of C.R. 951 (Collier Blvd.) and U.S. Rte. 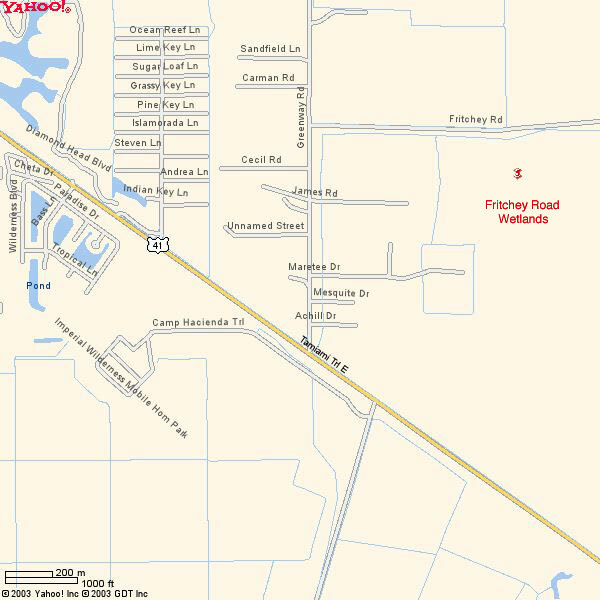 41 (Tamiami Trail), go south on C.R. 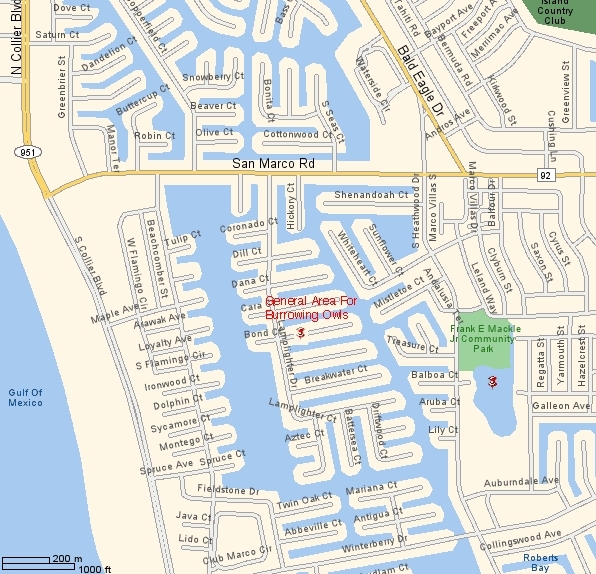 951 onto Marco Island until you reach Tigertail Ct. Go northwest on Tigertail Ct. to Hernando Dr. 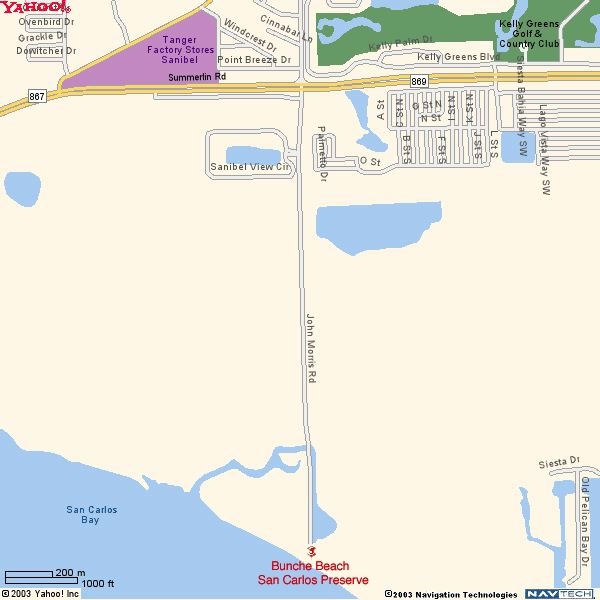 Turn southwest on Hernando Dr. until it deadends into Tigertail Beach — a Collier County Park. Parking is free to Collier County residents with a beach permit but costs others $3.00. One of the premier beaches and accompanying sandbars in the entire state. Excellent for shorebirds, terns, wading birds, gulls and raptors. The surrounding mangroves (especially near the parking areas) should be checked for warblers and other passerines, especially in migration. An easy stroll down the beach, especially on the “lagoon side” will yield all five species of plovers in winter. Least Terns and Black Skimmers nest here by the thousands in summer. Rarities and other uncommon birds that have made an appearance here are Red-necked Phalarope, Brown Noddy, American Avocet, Black-necked Stilt and Mangrove Cuckoo (along the shoreline buttonwoods). Immediately following a hurricane or summer tropical depression is the best time to look. Burrowing Owls can be viewed along Lamplighter Dr. & Lighthouse Ct. and other side streets off of nearby San Marco Drive. 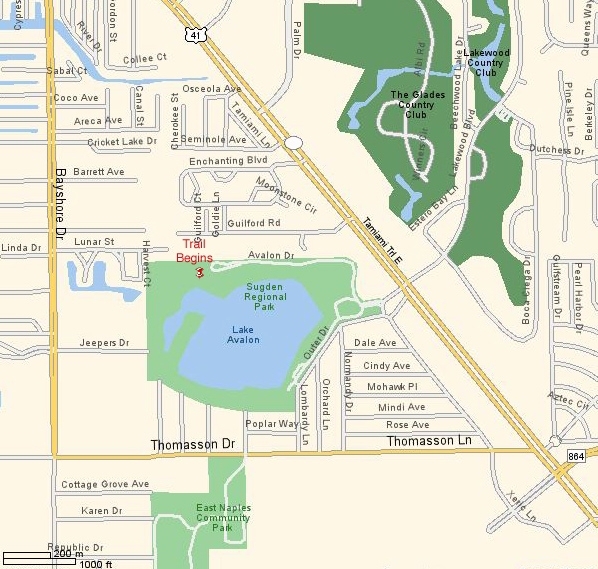 [Map] Frank E. Mackle, Jr. Community Park [Map] holds little of interest except ducks and only in winter. It is usually one of the best places to see Ruddy Ducks, Mottled Ducks, Northern Shoveler, Blue-winged Teal, Mallards (feral), Ring-necked Ducks and Lesser Scaup. Opened in January, 2002. Directions: on C.R. 951 (Collier Blvd.) go south of Davis Blvd. to Sabal Palm Rd. Head east on Sabal Palm Rd. approximately 3.5 miles and look for the trailhead and parking area on your right. 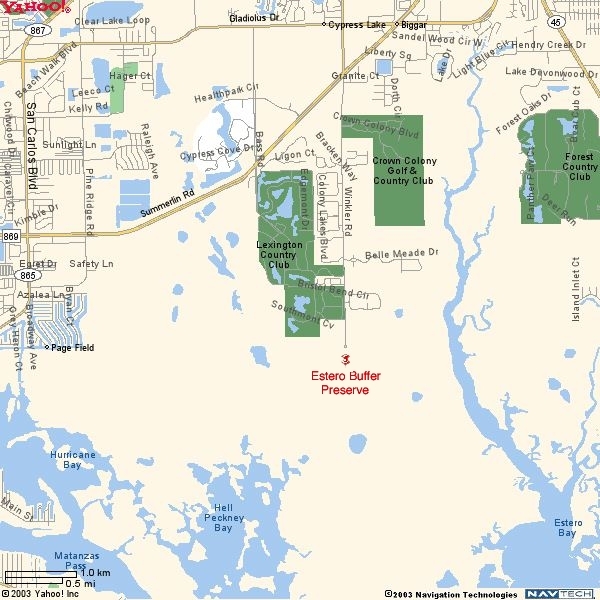 [Map] The land is managed by the Florida Division of Forestry and the trail was the project of Eagle Scout candidate and Naples High School student, Doug Nickerson. The trail is a “figure 8” with the total distance of both loops being 3.2 miles. 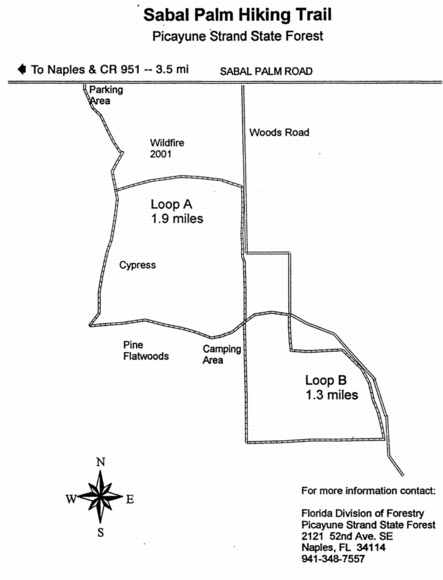 Loop A is 1.9 miles and Loop B is 1.3 miles. 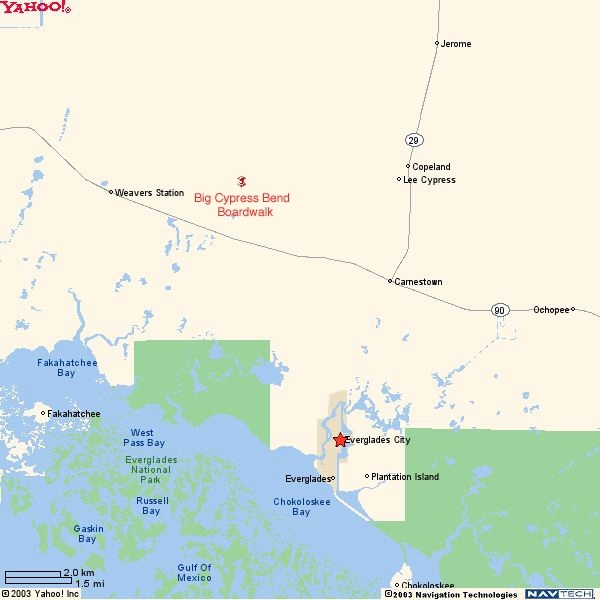 The primitive trail crosses through a hydric pine flatwoods into a beautiful Dwarf Cypress forest. Note: You should wear appropriate hiking boots or footwear that you won’t mind getting muddy or wet as the trail is often flooded, especially after it rains. There is an information kiosk at the trailhead, a picnic table about 100 yards down the trail and a camping area about half way around the figure 8. Doug Suitor, who works for Collier County, has found up to four Hairy Woodpeckers along the section of the trail that was burned in the wildfire of May, 2001. Other woodpeckers include Downy, Pileated, Red-bellied, and introduced (from Apalachicola National Forest near Sumatra in the Florida Panhandle) Red-cockaded Woodpeckers, slightly further south of the trail in the Picayune Strand State Forest. [Map] [Website]. Birders are asked to report their sightings to Vince Lucas, so that a database of birds might be generated for the area. 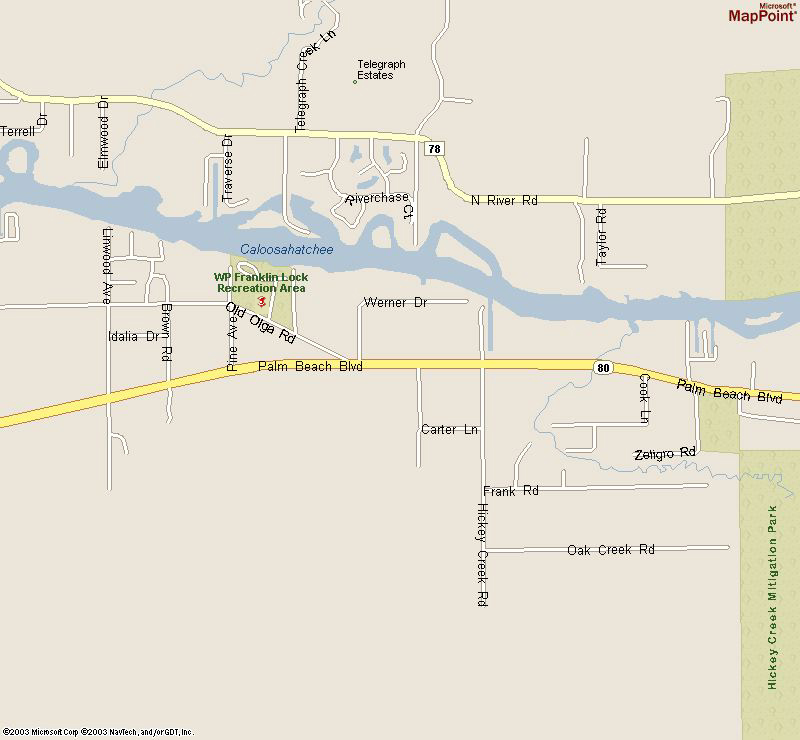 401 Shell Island Rd., Naples, FL. Phone: (239) 775-8569. There is no fee for the boardwalk anymore. It is free. There is a port a potty at the boardwalk for visitor use. There still is no running water for drinking or hand bathing. The boardwalk is manned, in season, by knowledgeable volunteers, Mon. thru Friday, generally from around 8:00 AM to 4:00 PM. There are no longer any bird feeders being used. Shiny Cow Birds still arrive in season and the scrub jays have been very sparse. The birding platform over the brackish body of water is often quite full and pretty deep for many of the wading birds. If the winter is dry, we should see lots of wading birds and also lots of swimmers. In past winters, if the water levels are not too deep, there have been lots of herons, egrets, spoonbills, mergansers, teals, coots, and then if things really dry up so we can have some mud flats, we’ll have lots of shore birds such as yellowlegs,stilts, killdeer and the like. Plus, we have had large groups of white pelicans and , of course, regardless of the water level, we always have a good amount of wrens, warblers etc. The eagles, ospreys, red shouldered hawks, sometimes clapper rails, still put on a show. By the end of Dec. 2010, we will have installed 8” X 12” metal signs on each of the 28 stops along the boardwalk that will help visitors understand what they are seeing as they walk along the boards. These signs will include photos of the plant life etc. along the boards. Last year, we also saw a variety of wildlife such as raccoons, deer, boar, bobcats, otter and the like. Thanks to Albert Katz, the Conservancy/Briggs volunteer coordinator for providing the above information. One of the local “thrills” for birders is seeing the Rose-ringed Parakeets that used to come into their nightly roost in and around the Eckerd Drug Store (junction Third Ave. South & US 41 aka 9th St. South) in Naples. Get there at least 45 minutes before sunset. The birds may be heard first flying around the neighborhood. Just listen for them. They usually roost in the Royal Palms by the Eckerd Drug Store. Recently, several Aratinga parakeets have been seen among these birds by Bill Pranty. He states in a post to FLORIDABIRDS-L “At least two were Blue-crowned Parakeets and at least two (three?) were White-eyed Parakeets. One bird may have “gotten away,” and the sixth bird, which allopreened with a Blue-crowned, awaits specific identification (if possible) and might be either a Mitred Parakeet or a Red-masked Parakeet.” There are reliable reports of a few Monk Parakeets in the Naples area as well. These are undoubtedly escapes from the pet trade. Note: beginning in late December 2001, the Rose-ringed Parakeets at this location have not been seen at their traditional evening roosts near the Eckerd Drug Store. For about two -three weeks in June/July of 2002 they reappeared there and then mysteriously disappeared again! Single birds or small flocks have been reported near the Naples Pier, Laudermilk Park, Doctor’s Pass and as far north as Collier’s Reserve in North Naples. UPDATE 12/01/02: The Rose-ringed Parakeet roost has been relocated at the Venetian Village on Gulf Shore Blvd. off of Park Shore and U.S. Rte. 41. Take a right on Park Shore from U.S. Rte. 41 if coming from the north, and take it to Gulf Shore Blvd. Turn left. The Venetian Village is just to the south of this intersection and the parakeets come into the trees (ficus?) in the middle of the turn-around at this condo complex. You are allowed to go in there to see the birds. 11/09 Bill Pranty has received information that 20 Rose-ringed Parakeets have been spotted in the area. Bill cautions that psittacids tend to move about and change roosting sites. 7/12 Vince Lucus reported seeing the parakeets and posted the following information on the Florida Birds Listserve.